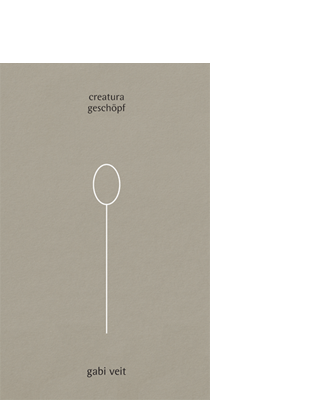 In her monograph Creatura | Geschöpf, the Bozen-born artist Gabi Veit takes an artistic stance on one of the most elementary cultural objects in the world: the spoon. From basic geometric simplicity – the handle as a line and the bowl as a circle – she develops an overwhelming variety of metal objects that both raise and answer questions. Who gives and who receives, what can be taken and be taken from? It is a play on the symbolism of abundance and emptiness. Each metal object is an expression of inexhaustible imagination and a playful engagement with the possibilities of design. The silver spoons have a head and a body, are handle and leg, are blossom, fruit and leaf. They march to a different tune and speak to one another as well as to the beholder and the user. Each spoon tells a story. GABI VEIT (b. 1968) studied graphic advertising in Innsbruck (AT) and Venice (IT). Since 1994 own agency. 2008 to 2011 studied contemporary jewellery at Alchimia in Florence (IT). Since 2011 own workshop in Bozen (IT) and near Zurich (CH).